I read somewhere that the number one way to reach a goal is to “write it down”. But then I found a DE-bunking article. That’s right, the second article proclaimed that the number one way to reach a goal is “to tell someone” your goal. Confusion! We have all learned about S.M.A.R.T. goals through Extension and we understand why we should have goals for our 4-H programs. But what makes these goals tangible? What will make them real and a central focus for every decision and thought that we have about the direction of parish programming? Last week I visited Brandi Frey in Pointe Coupee parish and while we were visiting, I was drawn back several times to her dry erase board which is tucked onto a shelf. (Check it out above). 18-19 Goals-Brandi is using the strategy of increasing her chances of her goals being accomplished by writing them down. But…she also has them available for her clientele, colleagues, and volunteers to review. She is actually telling everyone what her intentions are to strengthen her 4-H program by making S.M.A.R.T. goals. I think we are catching a glimpse of Brandi’s personality in her goal board too. I like “PLAN, PLAN” under Build J.L. Club. 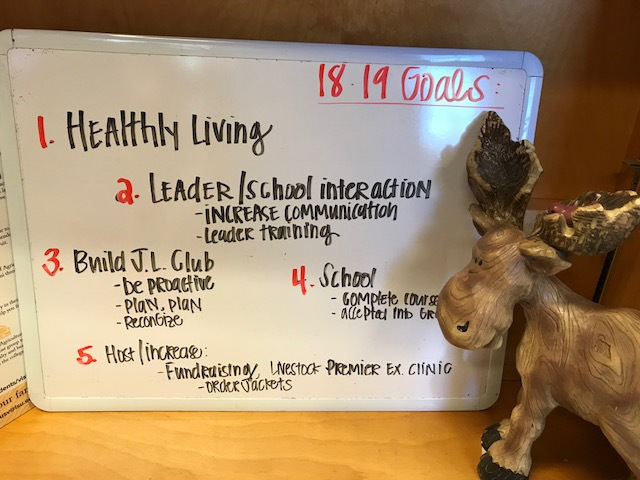 Let’s face it, there isn’t a project club in 4-H that has to be as flexible as working with teenagers who are continuously changing their minds and their plans. Teenagers will plan the J.L. year with all the bells and whistles, but when we hold them accountable we are on to plan B where “PLAN, PLAN” makes more sense. Brandi, thank you for your inspiration on goal setting. Oh, I’m not 100% sure what the carved wooden moose is all about, but he seems to be a cool dry erase board fixture and a character not found in any other office in the state. Go Moose! If you want to dig deeper and learn more about goal setting using S.M.A.R.T. goals. Please check out the links above.